I can’t believe I’ve never posted this dip before! This dip has been a family recipe for years! We love it during football games, it’s so easy to prepare and pop in the oven before the game starts! You can serve this recipe warm or cold, but its much better served fresh out of the oven! In a medium bowl, stir together cream cheese and mayonnaise, artichoke hearts, parmesan cheese and onions. Fold in crabmeat. Spoon into 9 inch pie plate. Bake uncovered, at 375 degrees about 25 minutes or until heated through. Serve with bread or crackers. There’s nothing better at Easter time and dying Easter eggs. We love to make egg salad with our eggs and also deviled eggs. This recpie is so simple and I’ve seen so many varations on it. The one I use though is from my family and it’s pretty basic. If eggs aren’t already hard boiled then you need to do that first! Take shell off the eggs and cut eggs in half, so that you have 12. Add all above ingredients in a bowl and mix together. Re-fill the eggs with the new yolk mixture. Sprinkle some paprika on top of the eggs. We had some leftover won ton wrappers from when I made won ton soup the other day, so I decided for football Sunday to make a batch of crab rangoons since we had all the ingredients sitting in the fridge. Ideally, it’s best to make these in a deep fryer but if you don’t have it’s just as easy to cook them on the stove top in a deep pan with hot oil. This recipe made 12 servings. The only thing that changes if you want to make more servings is the number of won ton wrappers. I have left over of the mixture to make at a later point this week. 1) Heat a pan with oil, enough oil to just about cover the rangoon. 2) Combine all ingredients into food processor or blender, mix until fine. 3) Drop about a tablespoon of mixture into won ton wrapper. so the won ton sticks together. 5) Place in hot oil until browned on all sides. 1) In a large bowl, combine the chicken, soy sauce, rice vinegar, cornstarch, sugar and sesame oil. Mix well. 2) Put a two pieces of the diced chicken in each of the middle of a won ton wrapper, brush cornstarch mixture on all edges. 3) Fold over to form a triangle, press to secure edges, encasing the filling. 4) Brush cornstarch mixture on one tip of the triangle. Bring two corners together and press to secure. 5) Place on clean, dry plate in one layer and cover loosely with damp paper towel to prevent drying. 1) In a large stockpot, add all but 2 cups of the broth and bring to a boil. The 2 cups of reserved broth should be room temperature or just slightly chilled. 2) Turn the heat to medium-high and add the won tons. Bring pot back to a gentle boil. 3) When it reaches a boil, add 1 cup of the reserved broth. 4) Bring back to a boil and again, add the remaining 1 cup of reserved broth. 5) Let it simmer for about 5 minutes and then serve. 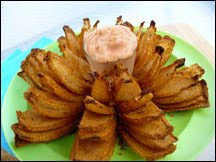 Who doesn’t love to order a bloomin’ onion when they go out to Texas Roadhouse or Outback. But come on, those have over 1,000 calories in them, and that’s not even including the dipping sauce. 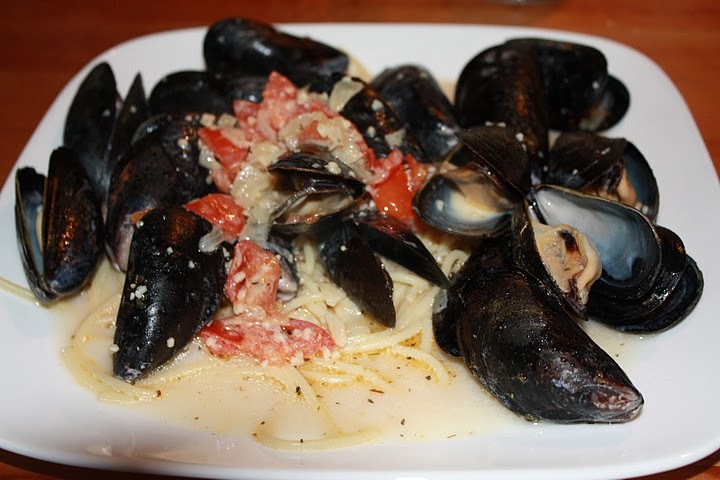 But guess what, the amazing Liza over at hungrygirl.com, has a recipe that has only 192 calories that includes the sauce. 2) Combine the cereal with the garlic powder and pepper, mix well. 4) Place the onion, cut side up, in a large bowl and cover completely with ice water. onion and dry off as well as the bowl. should now be covered in the egg. Transfer the onion to a dry bowl. each petal, again I used my hands to make sure of this. 7) Spray a baking dish with nonstick spray and place the onion in it, petals up. baking make the sauce ingredients. I bought this HUGE bag of crab legs at the grocery store last week, we were only able to eat about half of them. So I decided to make crab dip. Seriously, this was the worst idea ever because peeling and cracking about 50 crab legs your self is painful, nail breaking, time consuming and a hot mess. For sure, but the crab meat in the store. Anyways here’s the recipe. 1) Combine all ingredients in a large bowl, stir well. Chill for until ready to be eaten. 2) Serve with some tortilla chips or whole wheat pita bread.